Last month, there was a news article with the story of a young university graduate who landed a coveted internship position at a state-run company, only to find out her main task was to do school assignments for her boss’s daughter. She would volunteer to do late-night shifts to make PowerPoint presentations and other school projects for her boss’s grown child. In this era with a critically low fertility rate and record-high youth unemployment, we constantly hear about how the children of those in power -- lawmakers, politicians and high-ranking public servants -- are hired by the nation’s big corporations and the government, presumably with their parents’ backing with dubious ethics. Meanwhile, the youth unemployment rate is at its highest since 2000, with some 410,000 young Koreans in their 20s not in school and out of work as of June. The government blames youth unemployment for the nation’s increasing number of delayed marriages, which it believes is one of the biggest factors behind the low fertility rate. There is no doubt that raising a child is one of the most wonderful and rewarding parts of the human experience. But statistics suggest that a lot of Koreans could be opting to forgo such gifts of life as they are preoccupied with other life struggles. Koreans endure nearly the longest work hours among nations of the Organization for Economic Cooperation and Development, while a large number of workers have limited job security and are constantly sleep-deprived. Suicide has become the fourth most common cause of death here, with up to 40 people taking their own lives every day, according to government statistics. The proposal to boost the birthrate fundamentally fails to recognize what these statistics reflect, and that one's right to become a parent should be protected regardless of their education level, employment or marital status. The measures also included ways to start charging households with full-time housewives for the currently free day care services should they utilize it for more than seven hours daily. 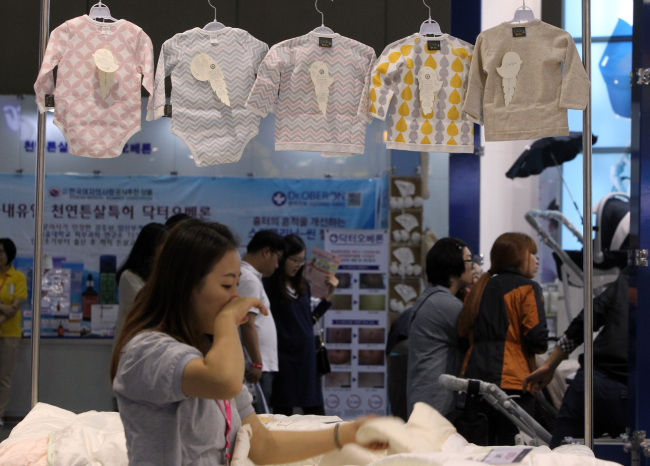 What’s behind Korea’s low fertility rate, as the grim statistics show, is the deep sense of despair -- stemming from the vicious circle of inequality and social mobility. Young Koreans born to financially struggling parents identify themselves as “dirt spoons” -- the opposite of those born with a silver spoon in their mouth -- with a bitter sense of limited personal control over their fate. It’s unsurprising that Koreans in their 20s and 30s call their own country “Hell Joseon,” a composite phrase of hell and the feudal Korean kingdom that lasted from 1392 to 1897 with a strict class hierarchy that offered no social mobility. As long as the government shows no willingness to tackle the core, no efforts to boost the nation’s birthrate would prove effective. On top of everything else, equal opportunity is what gives potential parents a reason to believe in the prospect of a better future for their children. What we need is social justice and conscience, not free diapers and matchmaking services.